Army Style Beds Strong Durable Army Style Beds. Strong Durable Army Style Beds. This steel bed is used in homes, dormitories, shelters, hunting lodges or anywhere you need a bed. Deluxe all-metal cot that folds away into a minimum of space. Steel platform bed with supports. Available in Twin Extra Long or Full Size. Strong Construction. Army-Style Folding Cot for use in Camps, Dormitories & Institutions Folds into compact flat unit. 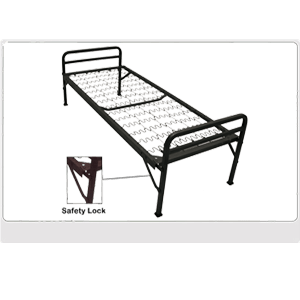 Strong Metal Army Style Single Bed. Easy to assemble.